VeganBurg launches Trufflebello Burg to celebrate the arrival of a joyous and green holiday season. Like all items on VeganBurg's menu, the Trufflebello Burg consists of the freshest plant-based ingredients sourced from sustainable sources, including cooking oil. VeganBurg has switched to certified sustainable oil to ensure that their products do not contribute to deforestation and unethical recruitment practices. The burger gives customers an unprecedented opportunity to reduce the environmental impact of the holiday season and bring Singapore one step closer to being haze-free. SINGAPORE, 31 OCTOBER 2017 - From Friday, 3 November 2017, VeganBurg will roll out its newest artisan burger, the Trufflebello Burg, in line with their recent partnership with People’s Movement to Stop Haze (PM Haze). Inspired by classic fall and winter flavours, the Trufflebello Burg is made with the freshest plant-based ingredients, and boasts a crispy Portobello patty lightly fried to perfection with sustainable palm oil. The burger gives customers an unprecedented opportunity to reduce the environmental impact of the holiday season and brings Singapore one step closer to being haze-free. Made with selected spices that are evocative of fall and winter, the Trufflebello Burg consists of spicy truffle aioli, shredded purple cabbage, sundried tomatoes, crispy Portobello mushroom patty, farm-fresh kale, egg-free mayo, and all sandwiched between a toasted fiber-fuelled bun. The artisan burger symbolizes the arrival of a joyous and green holiday season at VeganBurg. The Trufflebello Burger is priced at $10.90 a la carte, and $15.80 as a meal. 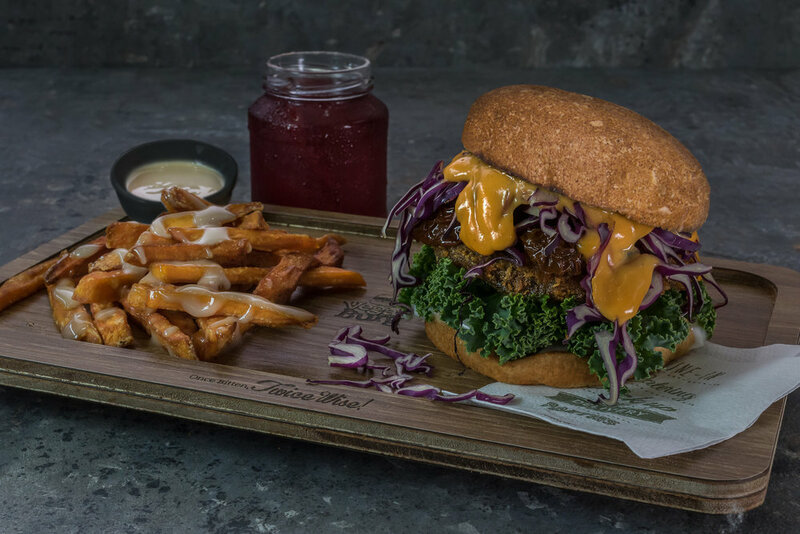 The Trufflebello Burger meal comes with Sweet Potato Fries with Maple Dip, and a Spiced Berry Punch. The burger will be available for dine-in, delivery and take-out at VeganBurg’s founding outlet in Jalan Eunos, while supplies last. For more information, visit veganburg.com/Singapore.